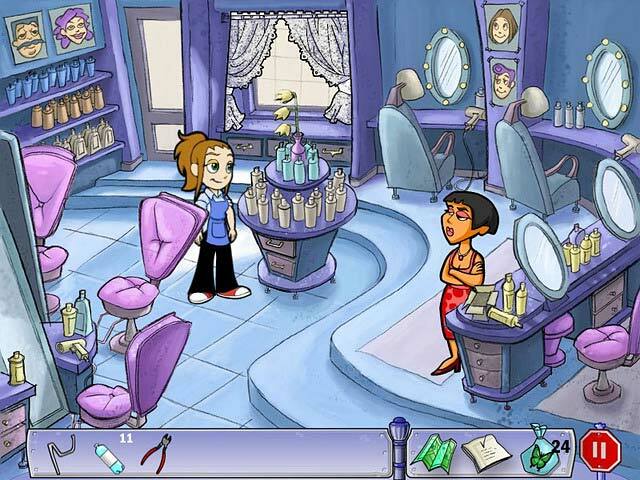 Avenue Flo features Flo, the beloved heroine of the Diner Dash series, and positions her in a more active adventure game where she must traverse the length and breadth of DinerTown on her latest quest. The game also marks the first speaking role for Flo and her cohorts adding a vibrant and more interactive feel to the game. Fans and newcomers will face Flo’s nail biting goal of saving DinerTown from the worst wedding disaster it’s ever faced – a potential catastrophe that touches almost every character and business in town! For those of us who are addicted to the Playfirst Dash games here is anhoter to add to your library.Doggie Dash is your standard time management game. Serve your customers (dogs and cats) before they get angry and leave. The more hearts they have when they are done with their services the more the owner pays.What’s surprising for me is how deceptively hard this game is.In Diner Dash you can tell who will wait longer and who is in a rush. For example: you can walk by a table of grannies about 10 times before they will leave, but a table of business women you’d better get to ASAP. The theory is the same in Doggie Dash. Some pets will wait longer than others. The problem with that is after awhile they all start to look the same. When they first come in all the dogs and cats look the same because they are all dirty or a shade of gray. I finally figured out how long they were willing to wait by associating the dogs and cats with the owners that brought them in. However, as soon as you take the dog or cat, the owner goes away and you find yourself so busy that you forget who can wait and who can’t.I also have issues with the upgrades. There are WAY too many choices. If you don’t make the exact right choices when it comes to upgrades in the middle of the level then there is no way you’ll pass that stage. For example: there are three basic stations: Wash, cut, and ribbon. Ribbon takes WAY longer than the wash station, so I always got an extra ribbon station before a wash station. However, the other upgrades are not so clear.You can only go so long without a treat station or a podium for example, but which one to buy first? Do I really need 2 massage stations right away? I spent $2000 on that stupid jupe box why does it only light up once per round? !Basically you could be on the same level for an hour trying to get the right combination of upgrades. Some people might find that fun. I found it frustrating. I really don’t want to play a single round more than 3 times in a game like Doggie Dash. Let’s face it: the Dash games are not meant to have a such a steep learning curve.